The stock market is uncertain about the possibility of a trade war and a hawkish Fed. However, I think a trade deal will be struck and the Fed will pull back on its hawkish 2019 guidance. Specifically, I expect the Fed to hike rates on Wednesday and guide for either 1 or 2 hikes in 2019. 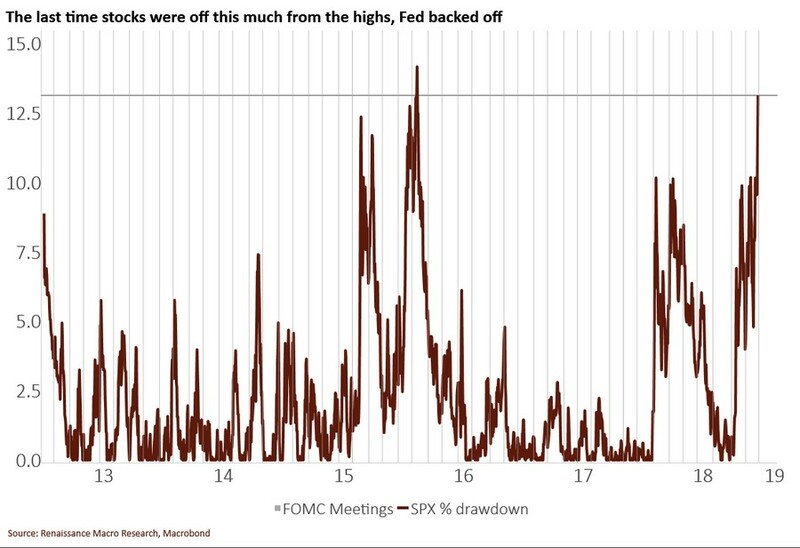 If the Fed guides for no hikes in 2019, stocks will rally sharply. Powell seems to be less concerned with the stock market than Yellen. But it would be highly unusual for him to ignore the latest volatility. 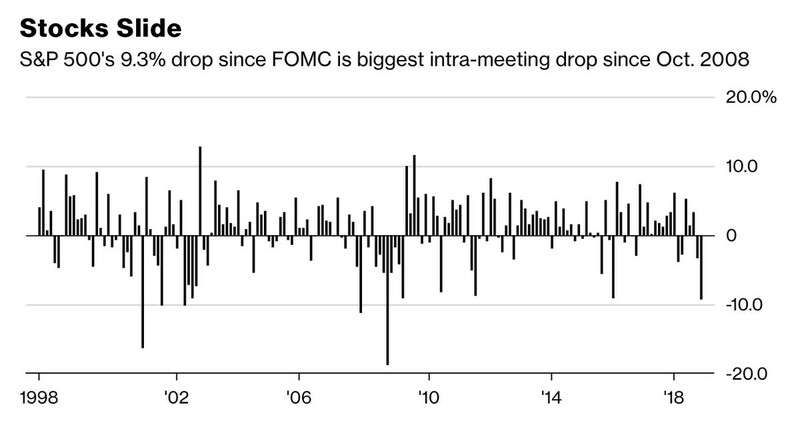 As you can see from the chart below, the S&P 500’s 9.3% decline intra-meeting is the largest since October 2008. We’ve seen the Fed react to declines that were smaller than this. Stocks Primed - Any dovish change should placate markets. If selling drives the Fed to be more dovish, lower prices will bring out buyers. The chart below shows the S&P 500’s returns slightly differently but brings us to the same conclusion. As you can see, the last time the S&P 500 was this much off its record high, the Fed backed off from its hawkish guidance. Specifically, the Fed expected to hike rates 4 times in 2016 but only ended up with 1 because of the volatility in late 2015 and early 2016. If the Fed goes with 3 fewer hikes rates than it guided for in September, there will be 0 hikes in 2019. I think this December hike could be the last one of this cycle. But I wouldn’t be surprised if the Fed still guides for 1 or 2 more in this meeting. If economic growth slows further, the other hikes will come off the table. Keep in mind, that the Fed funds futures market has been wrong about intermediate-term times. The problem with using it even for the December decision is that it’s right on the borderline (70%) of whether to expect a hike or not. Markets have had much more conviction about the last 8 hikes. The lowest percentage chance before those meetings was 83% in December 2015. It is currently 68%. A big takeaway from these charts is that the Fed will react to the stock market decline by moving in the dovish direction.